I wanted to evaluate my first year experience with the Back to Eden garden. I decided to break the experience into sections: preparation, planting, productivity, weeding and watering, overall experience. My rating scale is from 1-10 with 1 being unsuccessful and 10 being absolute success. The effort to reward ratio will be covered in the overall experience section, and will end with some common troubleshooting steps for issues some people run into. Our year one preparation began in mid October of 2016. We started with found newspaper and free wood chips from a tree trimming service I happened to flag down as they were clearing the power lines in front of our property. It took us about 2 months using only shovels, a rake, and a wheel barrow to move the mulch to the garden site. On a scale of 1 to 10 with one being minimal effort and 10 being maximum effort, I give preparation a 7 because of the amount of taxing physical labor and time consuming process (laying the paper) required due to our lack of equipment (like a tractor). The good news is, it cost us a whopping $0.00 by using found and free materials. This fall, we also added wood ash in addition to grass, leaves, and compost for next year. This will help keep the pH balanced and add to soil fertility for the coming spring. The most difficult aspect of planting was raking aside the mulch in order to plant directly in the soil. Because of how thickly we layed the mulch, there was a lot to be raked. 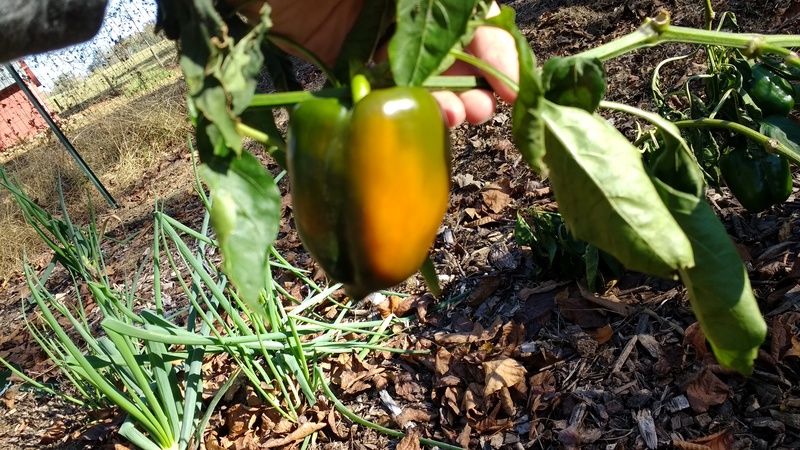 But, once the seeds were planted, germinated, and sprouted, I was able to push the mulch back around the plants, and pretty much forget about them until harvest time. There were a few negative factors unrelated to the B2E garden method, and those had to do with the age and source of seed I planted. We had about an 87% success rate with our seeds. What actually sprouted flourished exponentially, but there was unfortunately a lot of seed planted that never sprouted. And in that sense, there was a feeling of wasted effort. However, I give planting a 4 out of 10 for ease of planting and success of healthy seed germination, bearing in mind that before we could plant, we also had to combat the issue of erosion and water drainage by digging the swale and terracing. We maintained a 100% organic growing season using no chemical fertilizers or pesticides. 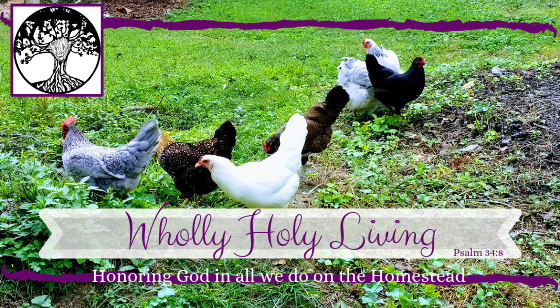 Chickens are great for both fertilization and insect pest control- it would have been nice to get them in there sooner, but it was their inagural year as well. That said, we did struggle with cabbage loopers and deer eating our crucifers and corn, respectively. In addition to the predators and pests, we also had some storms, and old seed that worked against the productivity. Storms broke or blew over several tomato plants and the old seed sprouted either very feebly or not at all. All in all, what produced for us was immensely successful, predominantly peas, beans, tomatoes, lettuce, cucumbers, squash (oh my lanta, squash!) Carrots, miniature pumpkins, watermelon all did fantastic. I’ve already raved about how impressed I was with the lack of weeding that was required. The reality of B2E gardening is that, yes, you can still get weeds. Either the weed seeds get dropped in by birds or other animals, they penetrate the paper and mulch layers, or they blow in from the neighbor’s yard. However, the overall amount of weeding I did comparable to that of those around me was beyond minimal. I needed only a hand rake, and weeding once a week took me less than 20 minutes each time. I did struggle with wild violet which has extensive root systems anyway, but I learned that if I let them get about 4-6″ tall, they pulled right out, root and all. It was an absolute joy to be in the garden. We did have to water a total of 4 times. The first was directly after planting, and the other 3 were after some dry spells. That’s still not daily or even weekly watering. The big concern this year was the intense rains we got as the hurricanes made landfall and traveled inland. We had no issues with rot or flooding and I attribute that to our permaculture/hugelkulture swale and God’s gracious nature in answering my prayers. I have to give weeding/watering 9 of 10 because while it was very near perfect conditions for us, we did still have to water and weed, though be it to a far lesser extent than traditional row gardening. Wood chip mulch AND leaf and grass and compost mulch for a total thickness of 8-10 inches. I’ve found that the people who struggle with weeds, negative insects (termites), or lack of nitrogen fail to do one or more of the things listed above. If you have a heavy termite population, using a pine or cedar (or combination) mulch will deter them. If you aren’t keen on wood chips, you can try leaves, grass, or straw instead. This method can lead to an increase in slug population, but that is easily amended by ducks or a border of salt around the garden area. By using the “whole tree” mulch, the leaves help the wood to break down. The layer of paper helps to prevent weeds and kill the underlying grass, which then becomes worm fodder. 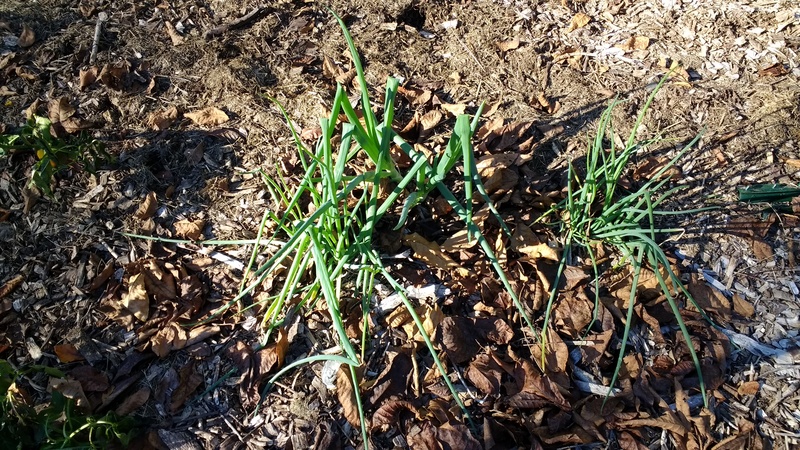 The thickness of the mulch will settle over the fall and winter, so laying it thick helps to shelter the soil underneath and retain moisture needed for germination in the spring, as well as kill off most weeds. 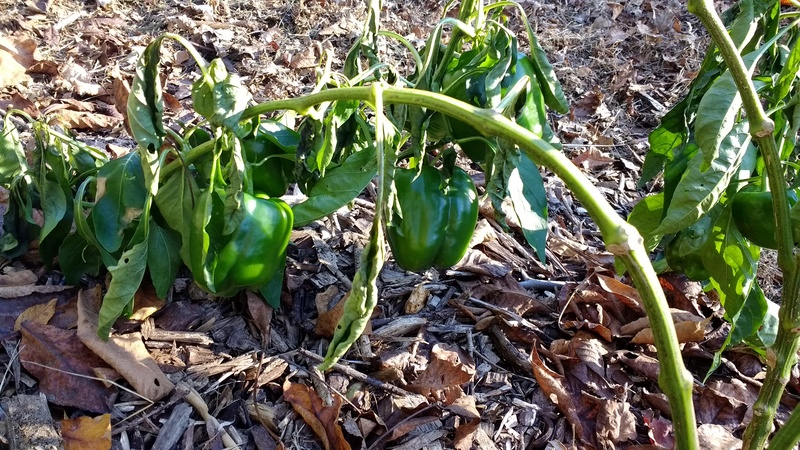 Preparing for the garden in the fall gives the land approximately 7 months (October to April) to decompose, retain winter moisture, and attract worms and other beneficials and develop the fungal hyphae*. For consideration, if you have an area of land you don’t necessarily need to use immediately, I would recommend layering chips and mulch and compost now, and leaving it to rest for a year or more. For real, folks. This Back to Eden garden is no joke when you do it the right way. It’s not something that can be short-cut. Then again, anything worth having is worth the work and the wait. My neighbors dont have gardens right now. Tomorrow will be November 4th, and I still have plants growing!!! Look at these peppers!!! Wilted leaves, yes, but still fruiting! And these…wait for it… RASPBERRIES! In all fairness, these very well may be late bearing variety… To be honest, I don’t remember what we planted. But the fact remains- my garden is still producing in November, after having a week of freezing temperatures overnight. And I would highly recommend the back to Eden deep mulching gardening system for anyone looking to organically and freely build their own top soil. *Fungal hyphae is integral to soil health and a thriving ecosystem in your garden. They work in massive underground networks to enrich the soil and decompose the wood chips into gorgeous topsoil.